The limited ‘state of emergency’ has turned permanent, but the movement grows in opposition to the socialist government of Francois Hollande. Public assemblies are banned, but people rise up to demand “the state of climate emergency and no state of social emergency”. This is important! It pushes back against the diktats of the government and the way it represses, conflates issues and stigmatises people in order to divide. At the end of 2015, a large part of the political forces on the left were agreed to say that it was difficult to mobilise, and difficult to unite the struggles throughout the country. The Left Front (Front de Gauche) had not managed to spearhead a new policy either. Armed attacks took place, followed by a clamp down on the public liberties, the state of emergency declaration, disproportionate police powers, bans on assemblies and more repression against Ecologists and Trade Unionists. Then came the debate to revise the Constitution. Some people accused of terrorism lost their double nationality, and this measure threatens to be extended. Under the emergency laws, the new possible accusation of ‘grave attempt to the life of the nation’ can have any one indicted. As political action gets increasingly conflated with terrorism, the result is a loss of public liberties. Now that police have been granted a special immunity, the integrity of the law is subverted. This marks the end of the equality of all before the law. On the first anniversary of the attacks at Charlie Hebdo, the ceremony achieved the opposite of what Francois Hollande had intended. He had called for a demonstration of ‘national unity’ where ‘all the people would unite’ regardless of political allegiance. What happened was a flop, with only a few hundred turning up. Successes are being achieved with new forms of popular resistance. These are mushrooming throughout the country, in defence of the values of solidarity and justice. 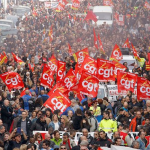 Mobilisations were organised in support of the political and Trade Union militants accused of ‘rebellion’ at Goodyear and Air France. The same is happening now to condemn the undignified and inhuman treatment of the immigrants. If there are immigrants, it is due to the war policies of the government, in places like Syria, Iraq, Mali and elsewhere. The immigrants are the creation of the imperialist coalitions of the Nato countries, and their policies. Cracks have opened in the government’s majority. Socialist MPs have created groups of opponents to the government, and some have resigned. For example, the MPs of the EELV – Europe Ecologie Les Verts’ – former allies of the Socialist Party, have been lost to it. A Mouvement Citoyen has been created amongst others, ‘to stop the surrender of the Republic’ and ‘to protect the basic freedoms’. Important divisions have also appeared in the parties of the right, as around the revision of the Constitution. 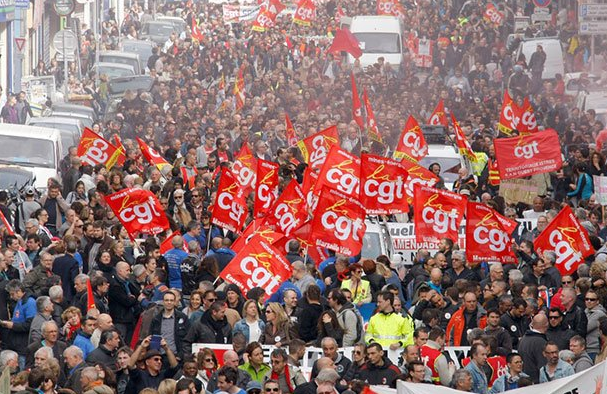 Big demonstrations continued throughout 2016 in France: Farmers, taxi drivers, haulage workers, petrochemical & industrial workers, public sector employees, demonstrations of pensioners, school-children parents, etc. There have been strikes even of police agents furious at months of unpaid overtime. It is now the reform of the Labour Law that crystallises all the angers. Since 2012, the ‘neo-liberal’ policy of this Hollande government managed to compound all the inequalities and hatreds. It did this by overturning all the fundamental human rights. The reform of the Labour code was presented by the socialist government as a necessity. People have too many social protections. The cost to the employers is too great, and this is why they do not recruit. We are also told that this is the cause of unemployment. And so a whole century of human rights is now thrown in the balance. Those rights were won in the class struggle, where the workers fought for secure levels of pay and conditions. This is how they created representative political institutions to reinforce their Trade Union rights. Since 1945 however, the employers’ class never stopped gnawing at all the gains and collective rights. In 2012, the Socialist Party and its candidate Francois Hollande promised ‘to shore up the Labour Code against the Medef’s wreckers’ (sort of CIB). The latter having declared its intention to put proper workers’ wreckers in its leadership. At the time, this had meant the steady overturning of the wage conventions; many laws had appeared, like the ANI laws of January 2013. This was followed by the National & Inter-professional Agreement, and the Loi Macron of 2015. All these combined in favour of the employers. The latter could now increase their profits by sacking workers more easily and replacing the 35h week by longer hours, and all for less money. The ‘intersyndicale’ is formed of 7 organisations. It is an inter-Trade Unions coordinator . It adopted a programme to mobilise workers until the Reform Labour Law is dropped. Many sectors have joined it, from the public sector to private companies, from agency workers to the part-timers of entertainment, from the unemployed to the pensioners. Debout on 1st May 2016, Paris. The Movement All Night Standing (Nuit Debout) started on 31 March 2016. Now it gathers strength every night at the Place de la République in Paris. The participants are Trade Unionists, activists, intellectuals etc. They want to unite the struggles now very spread over the country. 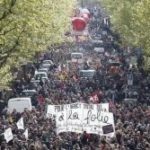 Although the organisers of Nuit Debout can resemble the Spanish Indignados of a few years ago, they do not agree with the comparison. Nuit Debout, they say, was not born spontaneously. It came out the sustained organisation of assemblies. Eventually, these gave rise to the huge demonstrations of 31 March 2016. [Reuters reported on 31.3.16: “The day of protest — which led to scores of arrests as youths and police clashed in Paris, Lyon and Nantes — marked the fourth such test of strength in a month for President Francois Hollande”. Editorial note]. 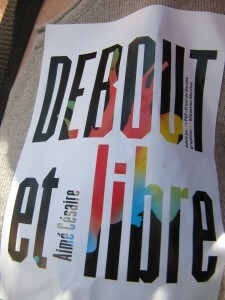 Nuit Debout emerged from many gatherings, until the slogan appeared: “After the demo, I don’t go home”. It is then that the Collective “Convergences” was born. This organization is an heterogeneous movement of non-violent protest. It seeks new forms of expression outside political parties and Trade Unions. It is extremely reticent towards the Trade Unions and some of its members swear to never want to vote socialist again. “THE CONVERGENCE OF STRUGGLES: A POLITICAL BLASPHEMY? During a public debate at the Trade Union Center, a thousand people responded in unison: “after the protests, we’re not going home, let’s spend the night on our feet!” A slogan was born, yet it was still to be decided what to make of these nights. They decided to break through the gloominess, recalling Seneca (the Roman philosopher and humorist): “Life isn’t about waiting for the storm to pass, it’s about learning to dance in the rain,” in order to call for the convergence of struggles. From the Place de la République where it started, Nuit Debout spread out to some 60 towns and other locations in the country. It was born in opposition to the State of Emergency; opposition to human liberties scrapped, to the security over-kill, to the tool of fear and the dismantlement of the labour rights. The national spread of this movement shows that the people are not giving up. Depending on who is involved, there are different forms of Nuit Debout in local areas. In Paris, the Commission Ecology-Climate published a Manifesto on the Environment. This document advocates breaking from capitalism “because it leads to the destruction of the human being and the planet”. It wants the end of subsidies in the production of fossil fuels. It wants the production of nuclear energy to be stopped too. It recommends the development of a bio-agriculture centred on the ‘local’ and the ‘seasonal’. It condemns agricultural ‘productivism’ and intensive husbandry. It recommends the production of agro-fuels; it condemns every form of land-grab. In its view, the polluting industries must be converted, starting with the armament industry that has turned the country into a warmonger. It wants the auto industries replaced by the creation of the means for public transport. It opposes CETA (the US-Canada-EU Trade Deal) and TAFTA (also known as TTIP, the US-EU Trade Deal) soon to be finalised. All gigantic and useless infrastructure projects should be stopped. In Rennes (Brittany), Nuit Debout grew around the question of how democracy operates in our society. It notes how we elect people who end up with all the power and no interest in the public good. In all the political debates, Nuit Debout in Rennes places the human being at the centre of the stage. Its followers demand the abolition of Article 49-3 – the article of the Constitution that allows laws to be enacted without parliamentary debate! Total transparency, they say, particularly in how public funds are used by public authorities and governments. Let us have automatic demotion for any councillor or MP found guilty of corruption; or guilty of traffic of influence, or of electoral or fiscal fraud. Those in who have been voted to public positions must attend their jobs at least 70% of the time. Let us have published accounts of all spoiled ballots in elections. Let us train everyone, of any age, in the ability to become servants of the public. The whole Trade Union movement is involved in the struggle against the Reform Labour Law. The Unions play their part in all the social movements and sectors fighting that Law seriously. This is quite a large chunk of the population. People have had enough of the ‘neo-liberalism’ of this socialist government; but the latter carries on, contemptuous of anyone opposed to cuts in living standards. You give me 49-3, I give you 1789. The Hollande government is increasingly determined to side with those whose interests are completely opposed to the public good. All these people look high and low for a way to push their Reform Law through Article 49-3. The last thing they want is for it to come up for discussion in parliament, particularly in light of the fact that 5,000 amendments are waiting there – submitted by MPs from all sides of the ‘House’. A never seen before! 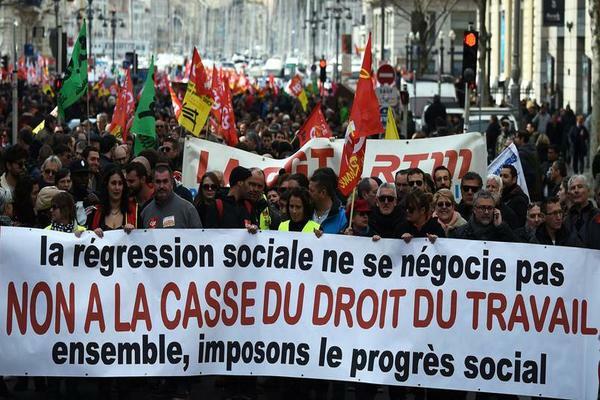 When the Hollande government realised how much anger its law provoked in the working class, it declared war on the CGT (Confederation Générale du Travail, the main Trade Union). Trade Union leaders were suddenly accused of being ‘hostage takers’ – as if the working class were delinquents and terrorists. In areas dominated by strikers or demonstrators, police proceed with strategies of encirclement followed by actions of exceptional violence within the ring. At the end of June 2016, the government wanted to cancel the right to demonstrate, but it had to back down; the last 2 demonstrations in Paris took place under the highest level of police control. People were bodily searched, metro stations blocked and every means used to stop people participating. This government shows signs of great powerlessness, however. It faces huge opposition not only in the streets, but in its own political camp. It lost parliamentary allies, as we have seen, with the break up of the Ecologist group in the National Assembly. The government makes up for its weakness by using provocateurs (casseurs). For their part, these people enjoy complete impunity. They infiltrate the social movements to divide them and get them discredited. Their actions allow protest and crime to be conflated. This saves to the government the trouble of negotiating with anybody, or even admitting that there is a real opposition out there. On 14 June, day of the anti-Labour-Law reform demonstration, there were more than 1 million people in the streets; but the media found nothing better to report than the doings of a band of misfits who had joined without even knowing what the demo was about. Those in power do not want to recognise the vitality and power of the resistance which has grown steadily over the last 4 months. Like Thatcher in her time, Francois Hollande keeps saying that: “there is no alternative”. But all he shows, in saying this, is that he has chosen his social camp; the capitalist camp, the camp of the bosses who constantly reiterate that they are those who create the country’s wealth! Social Democracy has really died a death, and its ‘third road’ has disappeared in the gap between the capitalism that we have, and the Socialism that we need. In the present context of exacerbating class struggle, it is the confrontation between two opposed concepts of society that keeps growing. The bourgeoisie of the Paris’ 16th arrondissement stopped the creation of a homeless centre there. A fitting image of the class hatred the bourgeoisie visits upon the whole the country; and a fitting representation of its most profound contempt for the working class, for the poorest in society and for the places where they live. The protest movements continue in spite of the state of Emergency and the great sharpening in police violence. The strikes and demonstrations stay firm in spite of the media’s repeated warnings that they are all tailing off. At this time, it is the social movements that re-invigorate the left political parties; it is them that deepen the crisis in the Socialist Party. This is how a common communiqué came to be signed by 10 left-wing parties and organisations. Some of these include EELV, MCR, Nouvelle Donne, Nouvelle Gauche Socialiste, PCF (Communist Party), Parti de Gauche, and Ensemble. The document announces their determination to keep going with strikes and mobilisations. They repudiate the way the Trade Unions are being attacked. They will not accept curbs on the right to demonstrate and they will continue to struggle until the reform Law is dropped. Although the social movement is vast, it suffers from a major fragmentation on its anti-capitalist left. This is partly why, on May 1st 2016, the Appeal of the Hundred was launched. Signed by MPs, Trade Unionists, Academics, intellectuals, heads of associations, artists and others, it proposes the following: “facilitate the irruption of the citizens” (on the social scene) and build the alternative with a debate on the need to transform society through the unity of all the progressive forces”. The Appeal calls for emergency measures to be identified immediately and used as a common platform and choose one single left candidate for the 2017 presidential elections. The political parties do not stand apart from the rest of the left. 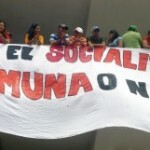 They are integrally involved in the mobilisations and the social movements. Indeed they are at the heart of the debates on the questions of political strategy and the need for a common front to change society. It was in that spirit that the 37th Congress of the PCF (French Communist Party) was prepared in early June. Important discussions took place in the Party about the present political situation; and about the strategy to employ for the ‘primaries’ of the left in view of the presidential elections in 2017. This needed to be clarified. At the time, the Socialist Party was envisaging its own ‘primaries’ behind a second mandate for Francois Hollande. The Socialist Party was favouring Hollande ‘to stop the left being wiped out by the rising right-wing and extreme right wing’. Was this to be accepted? 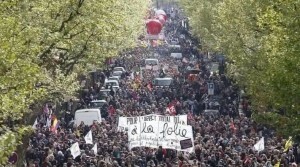 Or was it better to take a firm position against Hollande and the followers of his policy? Couldn’t we reconstitute the left forces with all the organisations prepared to build an anti-capitalist society? On this last question, there was a sharp debate in the PCF. The Party had prepared a guiding text for the Congress – which won 51.2% of the votes – but 4 other texts were presented as well. One of them sought to defend the experience of the Front de Gauche of 2012; its title was “The Human First”. It looked for a joint political project (with other parties) from which to choose one single left candidate for the presidentials. The debate ended with a document called “What sort of France?” It was approved by 71% of the participants. This document investigates five central questions: the democratic re-founding of the Republic, the struggle against unemployment, the social re-founding of Europe, the struggle against finance, and the construction of another model of society. To all intents and purposes, the PCF Congress based itself on the previous experience of the Front de Gauche. This is how it arrived at the idea of creating “un nouveau Front Populaire et Citoyen”. If successful, this Front should include the social movements, the citizens’ movements, and all their left-wing political, Trade Unionist and associative components. The Congress decided to communicate this decision to Jean-Luc Mélenchon, and to ask him to take part in this collective endeavour. It explained that a new political dynamic is required for another society; a society rid of capitalism and all its forms of exploitation. During this PCF Congress, important political choices were identified like the need to trigger a process of social transformation – starting from the struggles actually taking place. Congress accepted that this wants for a battle of ideas aimed at the conquest of power. The role of the Party must be to lead people, reverse the force relations, revise the practices of the past and build with the majority of the population. During the PCF Congress, the above debate was the context that led to a critique of Jean-Luc Mélenchon (JLM). In February 2016, JLM launched his “Movement de la France Insoumise” (unsubordinated France). On that date also, he announced his intention to stand as candidate in the 2017 ‘presidentials’. (His campaign is called JLM2017). Although JLM still enjoys the support of the Parti de Gauche, he launched his candidacy totally outside the framework of that Party, or any Party, and even outside the framework of his Front de Gauche partners! There are rumblings of profound disagreements around this way of doing things, given that his “Marche des Insoumis” took part and intervened in the weekend session of the PCF Congress. Beyond those questions, some of JLM’s proposals need deeper political scrutiny. This goes for his Plan B for Europe as well as for his idea of quitting the European Union. It goes also for his notions of Eco-Socialism and his opposition to TTIP in the context of purely chauvinistic arguments. Amongst the other political forces in the Front de Gauche, there is the organisation Ensemble. At its General Assembly in June, it discussed the present political situation and the importance of the social movements. It tended to give less weight to this, however, than its strategy for the 2017 presidential elections. Two positions confronted each other: the first, the majority, would use every means to build a large Left Front of all anti-capitalist forces; the other wishes to integrate immediately the “Mouvement France Insoumise” of JLM. This sector of Ensemble reckons that a large Left Front cannot be built in time for the elections. The social movement (Nuit Debout included) contains solid forces of progress,. It has shown its ability to battle for ideas in this period of political, ecological, social and cultural transition. This contrasts with the lack of lateral thinking and imagination of the traditional left-wing parties . These do not seem able to have alternatives outside electoral ones. Every electoral process, however, reiterates its limitation. You get political leaders elected with 10% of the vote on the basis of programmes and promises they abandon as soon as elected. Surely this shows that elections cannot be an aim in themselves. It is to make progress, and not just to take part in elections, that the situation requires the widest possible front of the left. To take part in elections is important to gain positions, certainly. Above everything however, the front is needed to mobilise the population in support of a programme of action to give priority to vital needs like jobs, health and culture – along with the development of another conception of life and of society. A new repartition of the riches is needed to reverse the curve of inequality. The great importance of the social movement of Nuit Debout lies in its new form of expression for the citizen. People are capable to develop the ideas they need to change society. This is why the political parties must take account of those movements. To those movements, the parties must give pride of place by their side; they must allow critical analyses to be made of their party policies. They must hear the critique of their functioning, of their apparatuses and of their non-democratic practices that rob the multitudes of their say, for the sake of party individual and careerist interests. To gather all the forces of the citizens – political, Trade Unionist and associative – will make possible the creation of the new force, a society rid of capitalism and all its forms of war. Francois G G N Hollande, born 1954, became president of France in 2012. In 2014, workers defending their rights at the Goodyear Tyre plant in Amiens kept 2 managers hostages in their own offices for 30 hours. Relatively heavy prison sentences were passed against some of those workers afterwards. On 27 May 2016, workers defending their rights tore at the shirt of 2 Air France managers in Bobigny. 3 workers who had taken part received prison sentences after having been found guilty of violence against their bosses. This is an Ecology Party, formed in France in 2010. This is a non-Party political organization formed in 2015. The new Labour Reform Law, also called “El Khomri” (named after Labour Minister Myriam El Khomri), was adopted on 8 August 2016. ANI Laws: Accord National Interprofessionel. An aspect of these laws introduces a supplementary health scheme for workers, so that “an employee benefit does not become a milstone around the employer’s neck”, extract from GEREP News, 24.3.2015. Quality of working life and professional equality, among other things. A law on minimum wage passed in July 2015. Macron became Socialist Minister of the Economy in 2014. Member of the Socialist Party 2006-2015. Resigned 2016. Formed a Centrist Party. 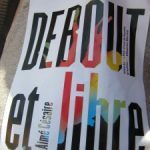 Nuit Debout started when the acclaimed documentary by Francois Ruffin was shown on TV called “Merci Patron” (“Thanks Boss”). Ruffin also publishes an alternative paper called Fakir that proudly claims to be “Against Everybody, or almost”. It accuses LVMH (a European multinational conglomerate originally from textile groups) of having destroyed the entire textile industry in Northern France. Fakir holds the view that it is possible to bring the big bosses to book, like Bernard Arnault (CEO of LVMH), and to make capitalism “very scared”. This refers to, and vilifies the workers’ actions at Air France and Goodyear. Demonstrations are banned in principle. Practice shows that it is not possible. EELV, ecologists. 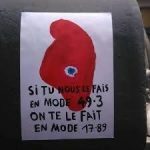 MCR: Mouvement des Citoyens pour la République. Nouvelle Donne: inspired by Roosevelt’s New Deal; it defends workers and small industrialists. Nouvelle Gauche Socialiste: supports Mélenchon. Parti de Gauche was created by Jean-Luc Mélanchon. Ensemble, also called Ensemble pour une gauche Ecologique et Solidaire, was created Nov 2013. See note 18. Front de Gauche (FdG) was initiated by the French Communist Party in 2009. It included the Parti de Gauche that Jean-Luc Mélenchon (Socialist Left) had created in 2006-08 to say NO to the Lisbon Treaty. The FdG included also the Gauche Unitaire, and it includes now Ecologists, Republicans, Left Radicals, left groups, as well as ‘Convergences and Alternative’ and ‘Ensemble’. Jean-Luc Mélenchon, born 1951. Became Senator for the Socialist Party in Essone in 1977. Previous to that, he had belonged to the ‘International Communist Organisation’. After some years in the Socialist Party, he formed the Parti de Gauche (to the left of the Socialist Party) in 2008, and the Front de Gauche (with the PCF and others). It is not clear whether he still belongs to those organisations today. He recently and unilaterally declared his intention to stand for President in the 2017 Presidential elections. JLM created the “Marche des Insoumis” on 5 June 2016 in Paris. On the day of the Brexit announcement, JLM said: ‘l’Europe, on la change ou on la quitte”. Ensemble was created in Nov 2013. 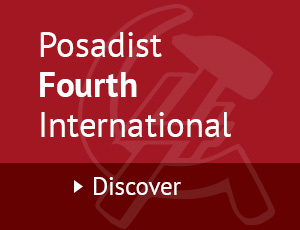 It defines itself as anti-capitalist, ecological, anti-racist and globalist. It contains Trade Unionists, ecologists, citizens’ associations, and elements with origins in Communists, Socialists and Trotskyists.